NOTIFICATION No. 18512/Admn/IHC by ISLAMABAD IHC HIGH COURT. ISLAMABAD dated 12 April 2019 regarding House-Rent-Ceiling instead of House Rent Allowance in Monthly Salary. 2. 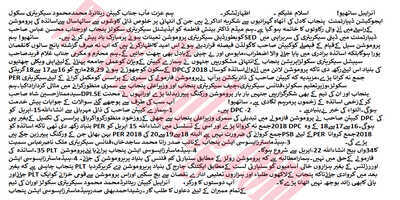 The Judicial Officers of Islamabad Judicial Service and Employees of District Judiciary (East & West) Islamabad, availing hiring facility shall be allowed House Rent Ceiling after the expiry of the period for which payment has already been made and thereafter hired houses shall also be de-hired. 3. The expenditure involved would be met from the budget allocated for the financial year 2019-20. No. 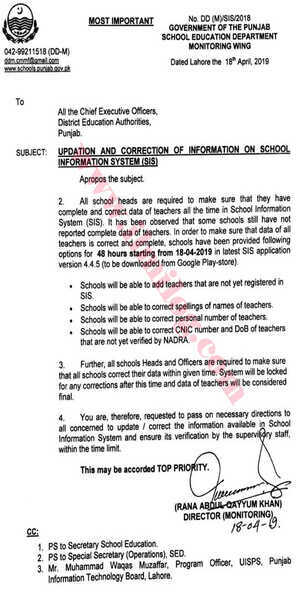 DD (M)/SIS/2018 by the government of the Punjab School Education Department dated 18-04-2019 regarding Update SIS App from Google Play Store and Correct Punjab Teachers Data. • Schools will be able to correct spellings of names of teachers • Schools will be able to correct the personal number of teachers. • Schools will be able to correct the CNIC number and DOB of teachers that are not yet verified by NADRA. 4. You are, therefore, requested to pass on necessary directions to all concerned to update/correct the information available in School Information System and ensure its verification by the supervisory staff within the time limit. It is to illuminate you that School Education Department has created E-Transfer System for instructors of Punjab with the joint effort of Punjab Information Technology Board (PITB-), Lahore. 1. Teachers should download SIS App (http://bit.ly/21C3Q1X) on their Android Phone and login to the App with given username and password. 2. View personal details (which were self-reported by school) and verify data. 3. In case of any updating/correction in the teacher's information (already self-reported by the school), concerned Head of the school will update data accordingly. Concerned officers will verify that correct data is updated in SIS. 4. SMS/App Alert will automatically be received on Teacher's App. 5. All E-Transfer applications will be ranked automatically based on marks for seniority, tenure, distance, wedlock, marital status, disabilities, etc., as per transfer policy. 6. The ranking will be made available online publicly. 7. CEO (DEA) concerned, will have login-based online access to transfer application rankings for each school. 8. 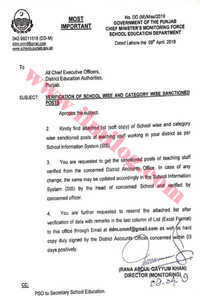 Top candidates for each school will be called by the CEO office for final document verification. 9. CEO office will approve or reject transfer application, in the online dashboard based upon documents verification. 10. After receiving the online acceptance, transfer order will be generated with the QR Code. 11. Concerned CEO (DEA) will set up a helpline in the district to provide information for the applicants. You are requested to disseminate the directions at all levels t ensure the compliance in letter and spirit. Once again it has been emphasized that no-transfer will be complete either through the lifting of the ban without e-Transfer SIS system. Teachers all categories searching transfer shall lodge their applications with the e-Transfer system. WhatsApp Update on messenger has received today Regarding Promotion of Teachers School Education Department Punjab.